A fourth round draft pick of the Buffalo Bills in 1973, Jeff Yeates’ National Football League (NFL) career started in the city where he was born, however it would be in Atlanta where he would cement his name as one of the best in Falcon’s history. Born in Buffalo in 1951, Jeff started his football career at Cardinal O’Hara High School. During his time in high school, he was the Team Captain, an All-WNY tackle, and was known for being an extremely hard hitter. During his senior season, he went through a brand-new helmet and three face masks. Yeates went on to Boston College to play all four years and graduate in the class of 1973. During his time with the Eagles, he was named to the UPI All-East team as well as the AP All-East all-star team in 1971. As a senior, Jeff’s toughness was on display, as he played through three torn knee ligaments, and still earned a trip to the Senior Bowl while receiving All-America Honors. His time in the NFL with Buffalo lasted only from 1974-76. After appearing in three games for the Bills in 1976, he was waived. Although Jeff’s dreams of playing for his hometown team were over, he pursued his NFL career once Atlanta came calling. 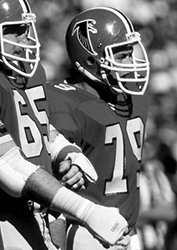 In 1978 he became a starter on the Falcons defensive line solidifying his legacy with the Falcons. He stayed with the team through the 1984 season. In his career, he played in 138 games, with 84 starts, in 11 seasons. Jeff Yeates is no stranger to various sports halls of fame, as he was inducted into the Boston College Varsity Club Athletic Hall of Fame in 1987 and the Cardinal O’Hara Athletic Hall of Fame in 2006. The Buffalo News selected him to their 50th Anniversary All-WNY 1st Team and the Bleacher Report labeled Yeates as one of the 50 best players in Atlanta Falcons history. Now Jeff adds induction into the Greater Buffalo Sports Hall of Fame to his storied career.